Last Saturday the weather in Hamburg was at its best. In bright sunshine, nearly sixty guests from Zurich, Lugano, Graz, Salzburg, Aachen and Berlin, among others, came to Hamburg. The cheerful group of architects and architecture enthusiasts met at five o’clock at the HafenCity information centre, the Kesselhaus. 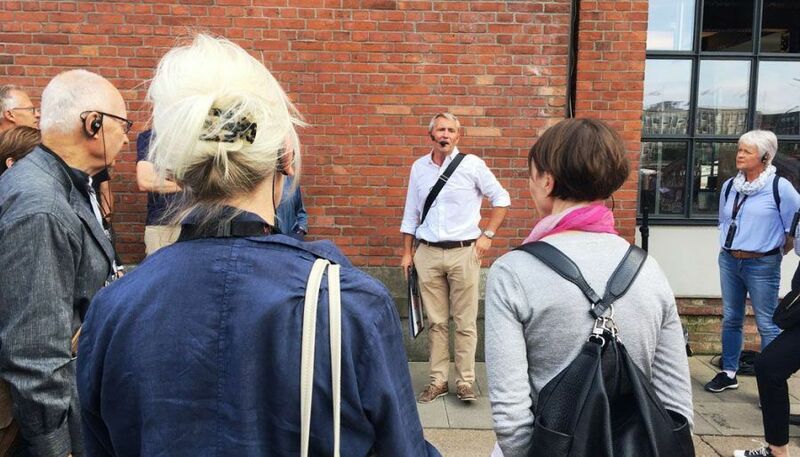 Torsten Stern, the owner of a-tour, welcomed the group and gave a brief overview of the historical development of the city. At the city model, the main urban planning ideas of HafenCity were explained. The HafenCity is the largest urban development project in Hamburg. Through a step-by-step planning and implementation process, approx. 157 ha of port areas directly in the south of Hamburg city centre are to be restructured. New buildings, with a total of around 2.7 million square metres of gross floor area, will be constructed on approx. 127 ha of land, only 800 m from the town hall. These include apartments for 12,000 to 14,000 inhabitants and service areas for more than 45,000 jobs. 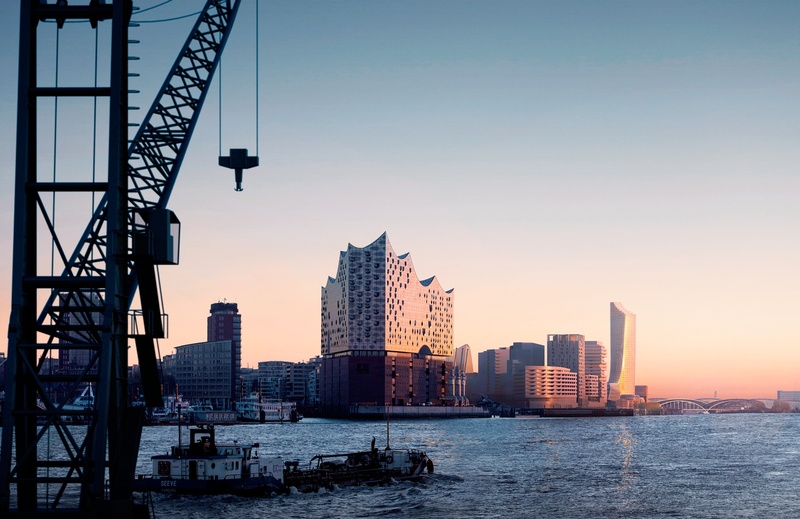 This new part of the city centre will enlarge it by 40%, providing a unique and historic opportunity for the city of Hamburg, which is now once again oriented towards the Elbe. 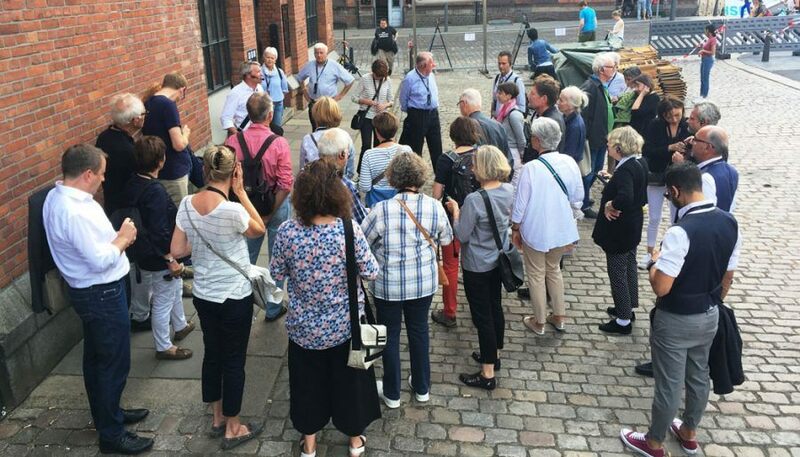 The group then walked over Sandtorkai and the pontoons in the inner harbour opposite the Magellan Terraces to the Elbphilharmonie. After just one year it is the new landmark of Hamburg and already an icon of contemporary architecture. Torsten reports on the bumpy genesis, which today, in retrospect, almost reads like the script of a planned production. 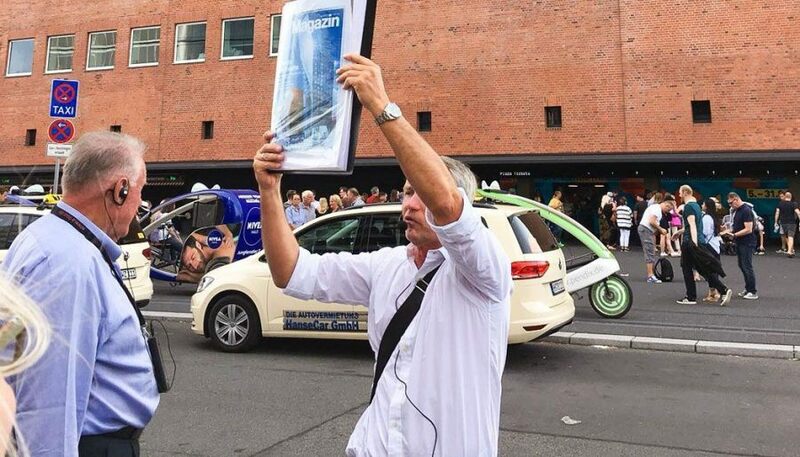 Of great ideas that are to be realized as a gift – free of charge for the City of Hamburg and in the shortest construction time – disputes about costs, construction standstill and a happy end that is unparalleled. From the outside, the tour participants learned everything worth knowing about the architecture, the building and the façade. Everyone already knew that the Elbphilharmonie was planned by the renowned architects Herzog & de Meuron. The base of the Elbphilharmonie was built from 1963 to 1966 as Kaispeicher A. The architect at the time was Werner Kallmorgen. In its function of handling a general cargo of tea, tobacco and cocoa, it soon became obsolete with the increase in container shipping. The window elements of the new building were printed with about 500 different print sample screens. The dot prints vary depending on the function of the room and orientation to the building and were precisely calculated. There are two different dot colors: the grey ceramic screen-printed dots reduce the solar radiation; the chrome dots increase the mirror effect on the outer facade. Then the group took the tube from the eastern forecourt to the western balcony. Here the participants learnt that the panorama window has no railing to emphasize the superb view. This window was already designed for Kaispeicher A under Werner Kallmorgen. It was here that the coffee hatch for the dock workers was accommodated with the idea for them to enjoy the view of the Elbe during their lunch break. After a short stop we continued the tour to the 37m high Plaza. From here we had a spectacular view over the city and the harbour. 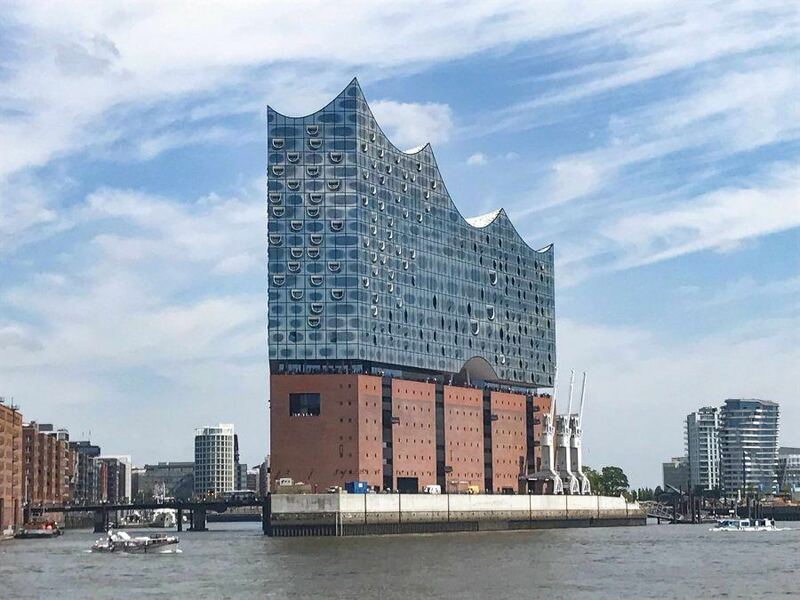 The special feature of the Elbphilharmonie is its unique combination of architecture, location and music: its outstanding architecture, its location on the waterfront directly in the Port of Hamburg and its diverse concert and music education programmes. A special feature is the visual axis that creates the connection between the city centre in the north and the port in the south. On the city side, the vaulted section is steeply designed, as a reference to the church towers of Hamburg, which have a decisive influence on the city silhouette. On the port side, the vaulted section is correspondingly flat and wide, as a reference to the port architecture. Of course, everyone will also experience the acoustic peculiarities. Both large and small halls are acoustically autonomous from the rest of the building. The large hall has two decoupling shells with 362 steel spring packages between the shells. The shells do not touch each other, so they cannot transmit the sound. As such, ship horns and propeller noises from the harbour, are not audible in the hall. In addition, no noise from the apartments or hotel rooms should enter the concert hall and vice versa. Yasuhisa Toyota was responsible for the acoustics of the concert halls of the Elbphilharmonie. All tiers and open spaces in the main hall are covered with the so-called “white skin” made of about 10,000 gypsum fibre boards, which were individually milled according to computer calculations. Each plate is unique and guarantees outstanding acoustic performance due to the precise scattering and reflection of the sound.